Often, the controversy surrounding immigration reform focuses on a struggle between those that contend immigration reform rewards lawlessness and others who argue reform is needed on a moral or humane basis. As the son of a Cuban mother, I can personally relate to the humane need for compassion as part of our American obligation to reform our terribly broken system and give illegal and undocumented people living and working here a chance to get right with the law and have a chance to pursue the American dream. At the same time, sone extreme hardliners are against any reform based upon humane, spiritual, or traditional American values rationales. For those that are against reform for those reasons, if you care about the American economy growong, then you cannot oppose smart immigration reform. Attached is an economic analysis that is fact based and frankly indisputably demonstrates that only an idiot could oppose reform unless you do not care about your wallet. For those of you without a heart, hopefully your economic self interest will prompt you to read the article attached and realize that your bank account needs immigration reform. At our southern border, there is a crisis. Children, CHILDREN, are arriving at our borders after surviving a treacherous journey no parent should imagine any child going through. Many are raped, abused, and sadly, many others never make it, dying along the trip. America has always been a special country. We have always helped other nations and peoples in crisis. It is partly what sets us apart from the rest of the world as the leader of the free world. We must now look to solve this crisis and help these kids. The solution isn't just beefed up border security. The Great Wall of China and Hadrian's Wall in England are stark reminders that walls fail. The real solution is to help these children, address future flow with smarter border solutions and by prosecuting big businesses that profit from 11 million illegal aliens, and most importantly, by passing Comprehensive Immigration Reform now. I am not blogging today as Chad Brandt, an immigration attorney in Orlando. I am blogging as an American. And I am not alone. The editorial board of Central Florida's own Orlando Sentinel shares my view, as do Republicans (see the Sentinel) and Democrats. Let's put politics aside and be Americans again, and help solve this crisis that's harming children by passing CIR now! See the article below. 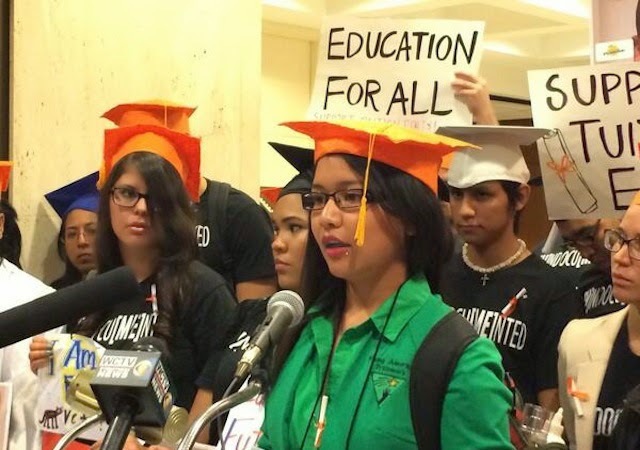 The Florida House voted Friday to approve a bill to allow undocumented students to pay in-state tuition at public universities and community colleges, ending a decade-long battle to pass the measure in the Florida Sate Legislature. The bill now heads to the desk of Republican Governor Rick Scott, who already said he plans to sign it into law. The bill will enable students, covered by the Obama administration's Deferred Action for Childhood Arrivals program, who came to the United States illegally as children, to pay in-state tuition at public universities. The Florida House voted 84-32 to approve HB 851, which makes undocumented students eligible for in-state tuition if they attend a Florida high school for at least three years and graduate. The House vote came a day after the Senate approved the bill on a 26-13 vote. Americans support every major immigration reform proposal on the table. Americans are overwhelmingly in favor of a variety of proposed reform measures, including implementing a new entry and exit visa tracking system (86% support/11% oppose), requiring employers to electronically verify the legal status of job-seekers (82%/16%), and giving the Department of Homeland Security more resources to secure the border (78%/21%). Each of these three proposals receives the support of at least three-quarters of voters from both parties. Clear majorities also support proposals such as a merit-based visa system for future legal immigrants (78% support/18% oppose), a start-up visa program for foreign entrepreneurs (73%/22%), allowing both more legal immigrants with advanced skills in science or technology (70%/28%) and allowing more lower-skilled legal immigrants as guest workers in industries with labor shortages (64%/33%). Voters agree that undocumented immigrants should have the opportunity to come out of the shadows and remain in the country legally – whether it’s described as pathway to “citizenship” or to “legal status.” Six in ten Americans support a “pathway to citizenship” for the estimated 11 million undocumented immigrants presently in the country (63% support/33% oppose). Support is similar for a “pathway to legal status” for undocumented immigrants (58%/37%). Regardless of how it is described, majorities across partisan lines – including Republicans (51% support “citizenship” and 56% support “legal status) – support these proposals. Meanwhile, voters are near-unanimous (88% support/11% oppose) in their support to creating a pathway to citizenship for undocumented immigrants who came here as children as long as they meet certain criteria. This measure earns the support of 90% of Democrats, 90% of Independents and 81% of Republicans. Voters roundly reject the immigration status quo. Americans overwhelmingly call for new reforms (79% adopt new reforms/15% leave the system as is) over leaving the current broken immigration system as is. There is clear political opportunity for members of Congress who back immigration reform. Americans are far more inclined to vote for incumbents who support immigration reform (39% more likely/9% less likely). This is true among Republican voters (41% more likely/11% less likely), Democrats (43% more/7% less), and Independents (34% more/11% less) alike. Americans will feel disappointment if Congress does not take this opportunity to reform the nation’s immigration laws. Roughly three in four voters (74% disappointed/25% not disappointed) will be disappointed if Congress does not act on any proposals currently being considered and fails to pass any new laws for the country’s immigration system. Federal immigration authorities will no longer deport non-criminal immigrant family members of former and active duty members of immigrants serving in the United States military. According to a Department of Homeland Security memo released Friday, November 15, 2013, the Obama administration states that illegal immigrants who are relatives of United States active military and veterans will no longer be deported, and can apply to stay in the United States. This new policy will apply to troops' and veterans' spouses, children and parents, who can now apply for parole status that will allow them to stay in the United States and suspend deportations. The parole status is authorized in one-year increments and allows relatives to adjust for permanent legal status. United States Citizenship and Immigration Services (USCIS) states that veterans have earned the right to keep their relatives in the United States, and wants to assist military members, veterans, and their families to navigate our complex immigration system and apply for naturalization and other immigration services and benefits. It is estimated that about five percent of the force, or more than 65,000 military immigrants, currently serve on active-duty. This new policy memo indicates that halting the deportation of immigrant family members would help to alleviate the “stress and anxiety” of these military personnel. "Similarly, our veterans, who have served and sacrificed for our nation, can face stress and anxiety because of the immigration status of their family members in the United States." "We as a nation have made a commitment to our veterans, to support and care for them. It is a commitment that begins at enlistment, and continues as they become veterans." Brandt Immigration handles immigration and citizenship issues on a daily basis and if you are a spouse, child, or parent of armed forces personnel, or have questions regarding this new policy, we encourage you to contact the experienced Immigration Attorneys at Brandt Immigration today. Immigration courts nationwide are continuing to adjudicate detained cases. Court functions that support the detained caseload will continue, but other functions are suspended. The Board of Immigration Appeals (BIA) is processing emergency stay requests as well as cases where the alien is detained, including case appeals, motions, federal court remands, and bonds. The stay line is open (for emergency stay calls only), but all other telephone lines have been switched to closed status. The BIA Clerk’s Office staff is accepting all filings and will be open Monday through Friday, from 8:00 a.m. until 4:30 p.m. In Orlando, evidence of the shutdown's effect was on display at the two-story building that houses the immigration court in an office park east of downtown. A sign on the door said the court was closed except for cases involving "detention." All others would be "re-scheduled when the government re-opens," the sign said. © 2012 Brandt Immigration. All Rights Reserved. Picture Window theme. Powered by Blogger.